Hoo boy. I have been looking forward to this ever since I got to interview the Foglios for Galactic Suburbia way back at Aussiecon4, when they announced they’d been given a deal with Night Shade Books for the novels. Actually, in some ways I have been looking forward to this for even longer: I first read about Agatha Clay in Girl Genius vol 9, the Hugo-nominated (and winning!) graphic novel. I had never heard of it before I got it in the Hugo packet, and… well… it was love. Pure, sweet, love. I read the entirety of vol 9; bought the ebook of vol 1; then discovered that you could just read the whole lot online, one page at a time. So I did that. One volume is one year’s worth of comics, and pages come out regular as clockwork every Monday, Wednesday, and Friday, so… yeh. You figure out how much reading that was. Yes, I know. I lot. But I love it. It’s got Romance! Adventure! Mad Science!! And this is the sans-illustration novelisation of, I think, the first three volumes of the graphic version. So yes yes, I’ve read the story before. But this is a different version. It’s like… the novelisation of a movie. Only better. 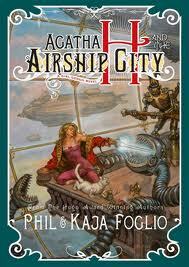 Officially, the Foglios – wife&husband team Kaja and Phil – call this ‘Gaslamp Fantasy’. Which is different from steampunk, and I can sort of see how but I can’t always explain. I think, basically, that with steampunk things are meant to make sense, in the same way that good SF makes sense in a scientific way (sorta). Fantasy, though – fantasy gets to cheat outrageously, when it wants to, by wiggling its fingers and saying ta-DA! And as long as it does it in an entertaining enough way, it’s fine. I know, I know – I’m exaggerating ridiculously here, and the genre purists will pull me up for it. Whatever. This is gaslamp fantasy because it’s kinda the European nineteenth century, but at the same time it’s really not, and there are serious mad scientists running around, mostly with The Spark. A Spark is like someone with The Knack: whatever they want to make, whatever they fix, it Just. Works. Although most Sparks end up going nuts or being crushed by their creations. They also have a propensity for lusting after entirely inappropriate women. I love the plot, too. Sure you could roll your eyes at yet another story about a poor orphan girl who discovers something amazing about herself, but you know what? Who cares! It’s fun! Agatha makes it worthwhile! There’s a reason those stories get written so often. And here, along with the self-discovery stuff, there’s some serious mad science, a one-km-long dirigible, lots of explosions, and a touch of romance. I bought the hardcover version, because the trade paperback isn’t out until August and that’s waaaay too long to wait (and it’s not very expensive anyway). It’s a lovely little production, with nice paper and cool cover art. My one gripe, and I’m a bit sad about it, is that there are some editing issues. There are a few spelling mistakes (‘access’ for ‘assess’), and someone really doesn’t like semi-colons – which would be fine if they used periods in their place, but mostly they used commas, and that just really, really, grated. Is it original? Not if you’ve read the comic, no. I have no idea what it would be like to read this cold; I imagine there are some bits that might be a little confusing, but I can’t be sure. But did I enjoy it? Hell yes. And I will certainly be buying the second one (Agatha H and the Clockwork Princess) and third (title still TBA), because I am that much of a fangirl. Wheee! I’m looking foward to reading this as well. We’ve got all nine volumes of the graphic novel, and I so heart the Jagermonsters! we bought them very slowly, over the course of years. Was quite the investment. Some people buy fine china and sterling silver flatware, we buy graphic novels.